Please enter correct email address! When it comes to range, the Hyundai Kona Electric SUV cranks out some impressive numbers. It can travel 258 miles on a single charge, which is 38 more miles than a Tesla Model 3. But driving range isn't the only thing the Korean crossover has going for it. Although the gasoline-powered Hyundai Kona debuted stateside last year, the electric version is new to North America. The zero-emissions model trades out the four-cylinder engine for an electric motor, battery, and accouterments. 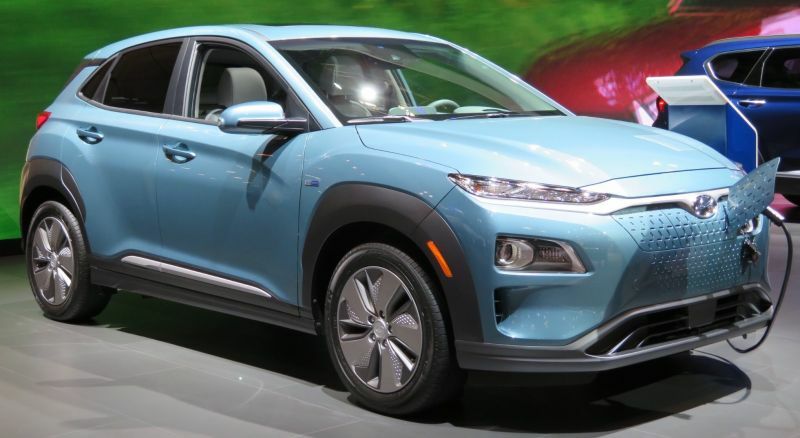 "Our new Kona Electric crossover is a stylish and efficient compact CUV, tailored to the needs of customers who pursue eco-focused active lifestyles requiring generous range," said Mike O'Brien, vice president of Product, Corporate and Digital Planning, Hyundai Motor America. "We're confident it will set new standards for the electric-propelled compact CUV segment, with outstanding range flexibility, appealing design, cutting-edge connectivity and class-leading available safety features. Outside, the EV features a modern design that's nearly identical to its petrol-sipping counterpart. There's just one glaring difference: the Electric car doesn't have a grille. There's no need for one, since the SUV doesn't require airflow for engine cooling. In addition to the smoothed-over front end, battery-powered models also get eco-spoke aero design wheels. The futuristic theme spills over into the interior. Front-row occupants are greeted by shift-by-wire drive controls and wireless device charging. Vital data such as battery life and energy flow can be accessed via a touchscreen infotainment system. Many advanced driver assistance technologies are bundled into the onboard Hyundai Smart Sense (HSS) suite. Highlights include standard Forward Collision-Avoidance Assist, along with optional Lane Keeping Assist, High Beam Assist and Driver Attention Warning. Blind-Spot Collision Warning and Rear Cross-Traffic Collison-Avoidance Assist are also offered. What really makes the Kona Electric intriguing, however, is its zero-emissions powertrain. The SUV is propelled by a permanent-magnet synchronous electric motor churning out 150 kW (201 horsepower) and 291 lb-ft. A liquid-cooled 64 kWh lithium-ion battery, operating at 356 volts, provides the unit with electrons. The combination is good for an estimated 117 MPGe, and a range of 258 miles. When it's time to juice up, the Kona Electric uses a 7.2 kW Level II charging system capable of achieving an 80 percent capacity in about nine hours and thirty-five minutes. Step up to a 100 kW Level III device, and the time drops to 54 minutes. No matter which option is chosen, charging takes place through a port located in the front grille area. In case you were wondering, the name Kona is derived from the idyllic west-coast region of the Big Island of Hawaii. According to Hyundai, the area is "famous among endurance triathletes and thrill-seeking travelers." Maybe, but the Kona SUV is just as much about sensibility as it is thrills and excitement. The 2019 model will go on sale in California during the fourth quarter of 2018. It will be available in other EV-friendly states soon after. Mia is an ASE Certified Master Automobile Technician, L1, L2 and L3 Advanced Level Specialist. She has over 12 years of experience in the automotive industry and a bachelor’s degree in automotive technology. These skills have been applied toward content writing, technical writing, inspections, consulting, automotive software engineering.